This article is from Hakai Magazine, an online publication about science and society in coastal ecosystems. Read more stories like this here. Wild salmon are struggling to get their groove back. Along North America’s Pacific coast, salmon populations—already hit by overfishing—have been forced to dodge the Blob and hungry seals. 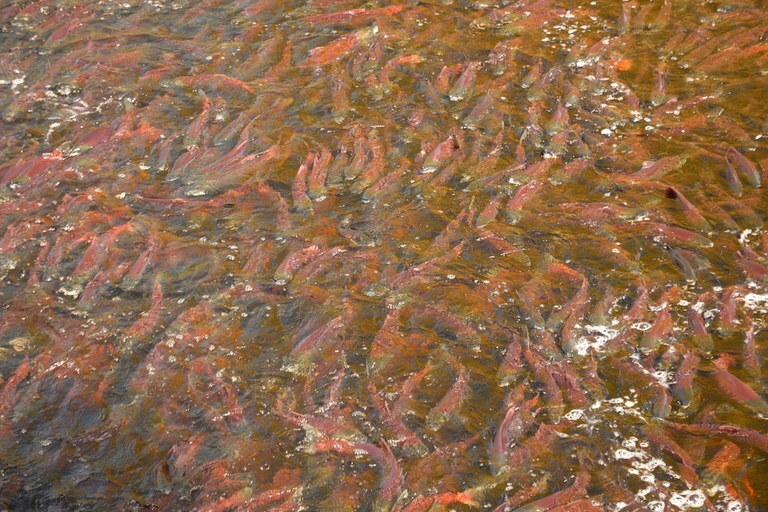 For years, Canada has tried to help bolster the salmon population by releasing hatchery-raised juvenile fish, or smolts, into the wild. Scientists know these hatchery smolts don’t do well in the wild—the fish tend to die younger than their wild brethren and reproduce less, but it’s unclear why. In a recent study, however, researchers think they’ve hit upon a possible explanation. In two British Columbia streams, researchers caught coho salmon smolts that were making their way out to sea for the first time. Some of the fish had been born in hatcheries, while others were wild. Comparing the genetics of the hatchery- and wild-born smolts, the scientists found a huge difference between the two populations. But the changes weren’t so much in their genetics as in how their genes were regulated and expressed—their epigenetics. Epigenetics is the physical and molecular processes that control how the instructions contained within DNA get expressed or turned into the proteins that affect day-to-day life. Often, epigenetics causes a gene to be expressed more or less frequently than it otherwise would. Everything from stress to chemicals to natural processes like puberty can cause epigenetic changes. Some of the changes are temporary or reversible, while others last forever. Salmon at the Fulton River Salmon Project in British Columbia, the largest man-made salmon hatchery in the world. Suppose, for instance, that rather than a jumble of folded proteins, your DNA is a cassette tape of Phil Collins’s 1985 smash album No Jacket Required. When you were born, your DNA was a factory-made tape—you had the same physical spool of tape, more or less, as 13 million other fans. But say a section of your tape was kinked or twisted after unspooling in the stereo of your Trans Am, garbling the classic riffs of “Sussudio.” Meanwhile, your brother can rock out to “Sussudio” just fine, but he accidentally erased the sultry chorus of “Inside Out” while making a mixtape for his girlfriend. Much like these changes will affect which of Collins’s epic rhythms you and your brother respectively blast, epigenetics can permanently or semipermanently affect how genes get expressed. In the case of the salmon, Louis Bernatchez, a population biologist at Laval University who worked on the new research, found that while hatchery- and wild-born coho smolts have similar genetic profiles—which makes sense since the two are closely related—some parts of their DNA have wildly different epigenetics. But more than this, Bernatchez found that all the hatchery-raised fish had similar epigenetic changes, even for fish reared at different hatcheries. Just as two different cassettes chewed up in the same spot of “One More Night” suggest an issue with the tape deck, Bernatchez suspected there’s something about hatchery life that triggers epigenetic changes. He points to two features as possible suspects: atypical food and overcrowding. “Some of those genes are important in appetite, important in osmoregulation,” Bernatchez says. He stresses that these epigenetic effects don’t necessarily explain hatchery fish’s shortcomings as adults. In part, that’s because it’s still not completely clear which traits they affect, or how long the changes last. But it does open new avenues to explore. In Washington State, hatchery-spawned steelhead also do poorly in the wild. But Penny Swanson, division director of the Northwest Fisheries Science Center, says that while epigenetics may play a part, there are other factors that could account for hatchery fish’s struggles. For example, fish that do well in hatcheries often have voracious appetites and grow quickly, she says. This serves them well in captivity, but not in the wild, where searching for food and enduring hunger are more important. But it’s not clear if hatchery conditions lead to a form of artificial selection, where the quickest gobblers survive, or if the food, temperature, or relatively sedentary lifestyle are modifying the fish’s genes through epigenetic effects. Swanson thinks Bernatchez’s research lays important groundwork for untangling the different factors, but there’s still a lot to study, such as epigenetics in fish at different ages. This is tricky to do with wild populations, she says, in comparison to the captive or domestic animals on which most epigenetics research is done, because the natural genetic variation is much wider and less understood. Mackenzie Gavery, a post-doctorate researcher working with Swanson, agrees that it’s a leap to suggest the epigenetic changes seen in smolts are affecting their success as adults. There’s a big gap in time between when smolts head out to sea and when they return to breed as adults, she says. Gavery also notes that many epigenetic changes are natural, transient, and even reversible. Like straightening a twisted cassette ribbon by rewinding it with a pencil, epigenetic changes in the smolts may be gone by the time they return to spawn. Bernatchez hopes that further study will untangle how persistent the epigenetic changes are, as well as make it clearer how they’re manifesting in the fish. But it’s a new field, and the researchers still have a long long way to go. Read more coastal science stories at Hakai Magazine.